This classic commentary, a model of brevity and profundity, has never been made so clear in any language. Rabbi Ovadiah Sforno was a 16th-century Italian rabbi and physician whose comments and insights are as relevant today as they were in his day. 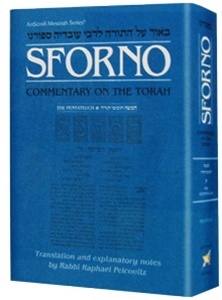 This volume includes the entire Chumash text and translation as well as the most accurate version of Sforno. Translated and annotated by Rabbi Raphael Pelcovitz. Complete in one volume. Now with full Chumash text and translation.